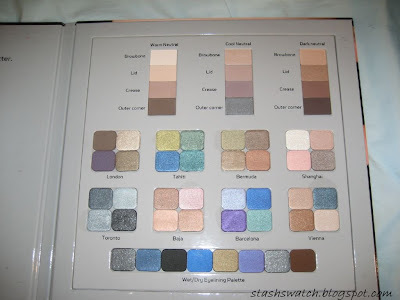 The last palette included in the Eyeshadow book was the Wet/Dry Eyelining palette, which retails for $32. This palette was probably the only disappointment in the book as the colors don't quite apply all that smoothly wet and are somewhat unimpressive to me dry. 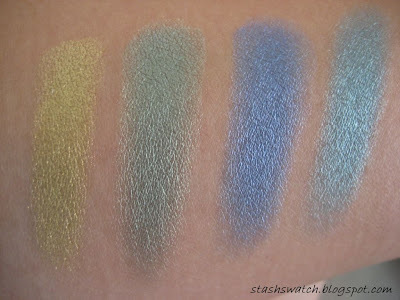 You can use these as eyeshadows as well, but they're a bit chalky, so I'm not sure any of these will see much use, if any. 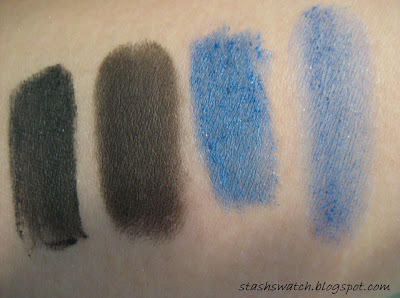 I swatched each color wet (left) then dry (right) for comparison. The second part of this 3 part series is Cargo's color quads. There are a total of 8 quads and each of these retails for $28 and can be found at Sephora. 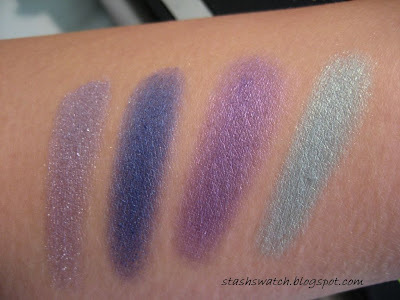 I took pictures and swatched these in indoor natural lighting (though a window) so there may be some variability in the lighting. 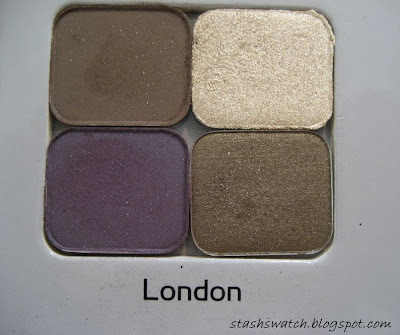 London: Overall, this quad isn't something I'd normally buy, though it's nice for me to have as part of this palette nonetheless. 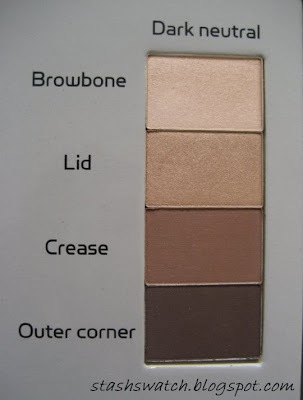 This quad contains a dark, matte brown similar to the "outer corner" shade in the warm neutral palette. 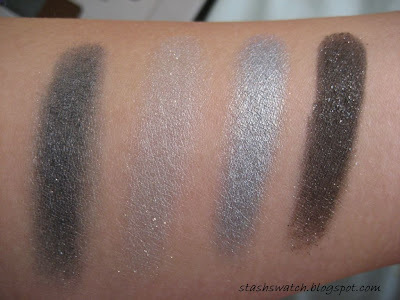 This shade is a touch greyer than the one in the warm neutral palette on my hand, but on my lids, they're very similar. 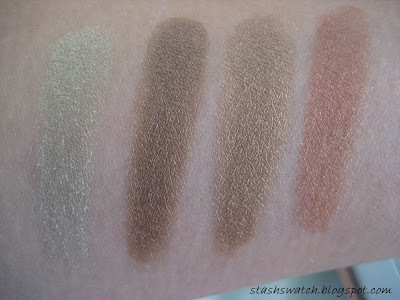 Next is a slightly frosty yellow beige shade; of the 4 shades in this quad, this one has the softest texture. 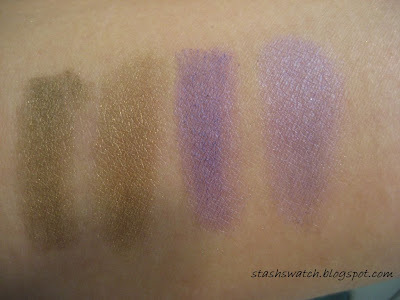 The purple in this quad is the chalkiest in this quad and is a warm, slightly reddish purple on my skin. If not used carefully, this color comes off bruisey, and it is very easy to give yourself a 'bleack eye' look with this shade. 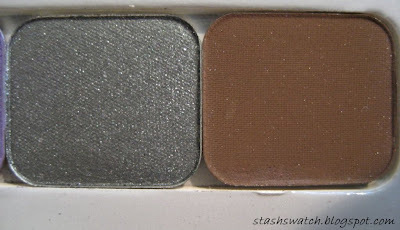 The final shade in this quad is a shimmery brown with olive tones. 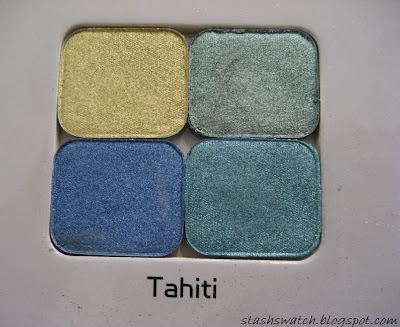 Tahiti is probably my 2nd favorite quad in this palette. It's a nice collection of cute, bright summery colors. It contains a light yellow-green, a green, a teal, and a blue. 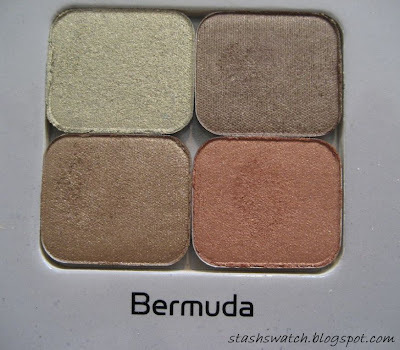 The yellow-green color is the softest texture-wise in this quad and also has the most shimmer. 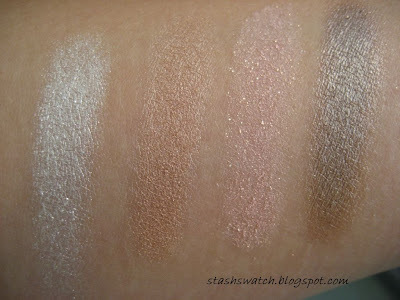 The texture and shimmer on the other 3 are all around the same level. I accidently deleted the picture of Toronto that I was originally going to use, so when I retook this picture, the sun was close to setting, so the lighting for the picture of the quad itself is very cool toned. 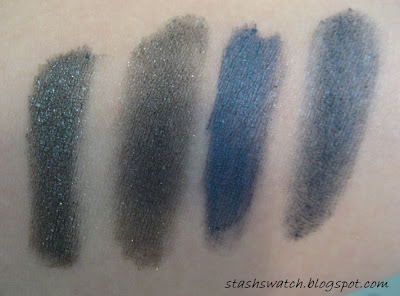 Nevertheless, Totonto is a collection of blue-greys and a chalky sparkly black shade. 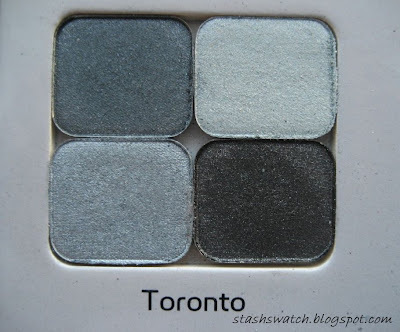 Of the 8 quads, I find that Toronto has the worst texture, with the sparkly black being the chalkiest and the shade to the left of it being the softest. 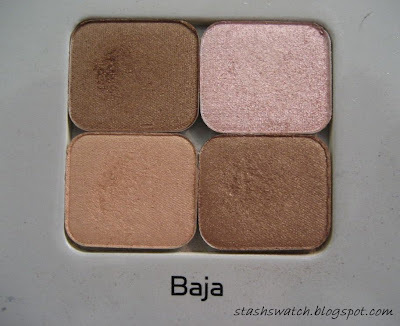 Baja is a quad that contains 2 bronzes, a peach and a frosty pink shade. 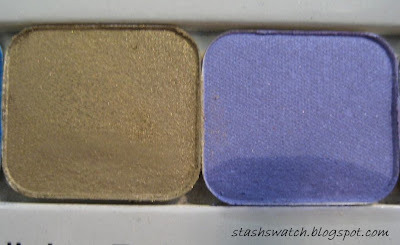 On my lids, I can't particularly tell the difference between the two bronzes, but I have small lids. 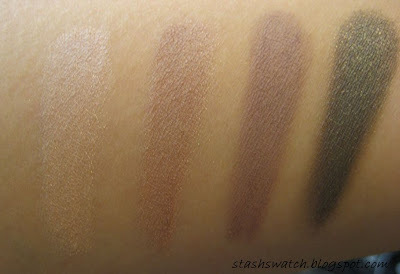 The difference is decently clear in the swatch photo though. 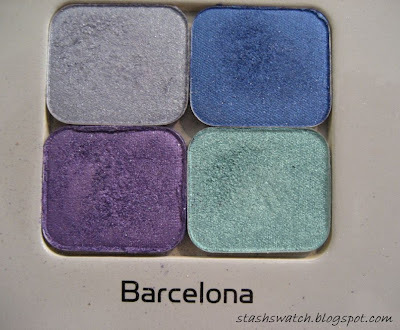 Barcelona is my favorite Cargo quad, with two purples, a blue, and a cool toned green. 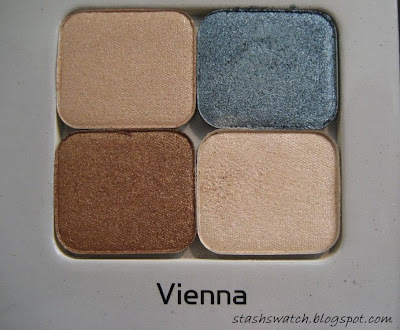 I was quite ready to love Vienna, but the bronze in this quad is definitely very very warm. PAst that shade, it also contains a shimmery. 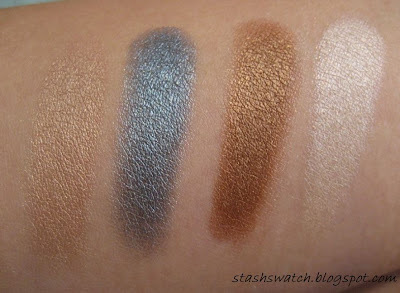 warm beige, a darker, peachy beigh, and a shimmery blue with slight grey tones. 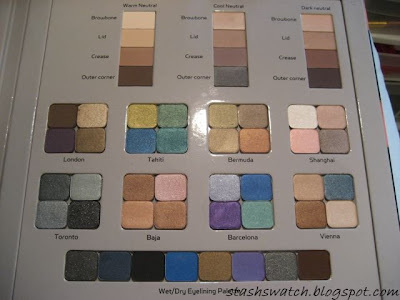 A few months ago, I was lucky enough to score an enormous palette off ebay containing the majority of Cargo's eyeshadow quads. 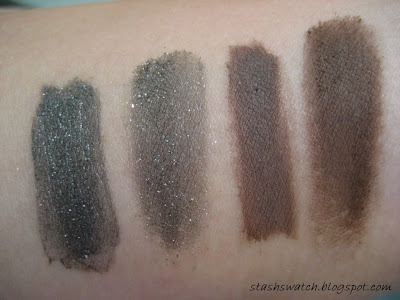 I finally got around to swatching it this week so I decided to share the swatches with you guys. The palette itself is an enormous monstrousity measuring 12.25"x 12.25" and is made of cardboard that flips open like a book. There aren't any magnets or anything holding the palette shut. It's a bit unweildly and hard to store, but it was a great value, and contains a ton of colors I wouldn't have thought to buy otherwise (despite loving now). 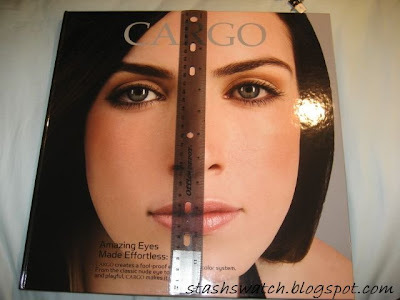 In fact, out of all of Cargo's quads, the only one I ever thought to buy was the cool neutral essential eye palette in Cool neutral. Here's another pic of the palette open, but with flash. This palette's so big and my room's lighting is so crappy that it was difficult to take really clear pics of the sucker. 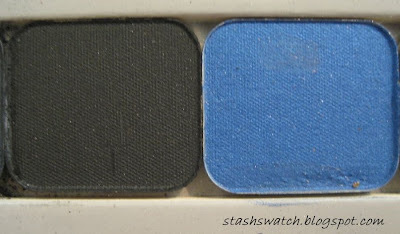 I'm going to split up the swatches into groups because there were over 30 pics in this swatch set overall, which I think is a bit large for 1 post. I'm also splitting it up because both my laptop and netbook are out of commission, so I have no way of uploading new pics for a while. Pics were taken in cool natural indoor lighting for the most part. 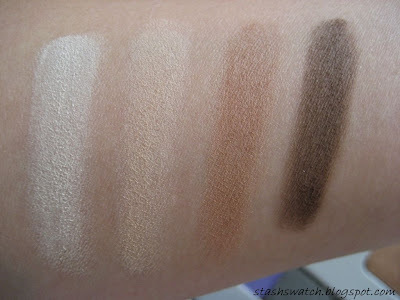 The swatches for this palette may look a bit dry and chalky looking, but I assure you that it isn't an issue so much with the eyeshadows as it was with how dry my skin was when I started swatching. The rest of the photos should be fine after this one. 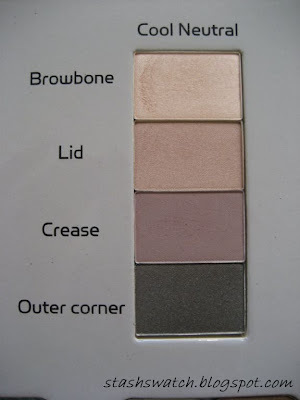 The Warm neutral quad contains a light matte beige, a slightly darker, warmer matte beige, a slightly satiny, warm, light brown, and a darker somewhat satiny darker brown. 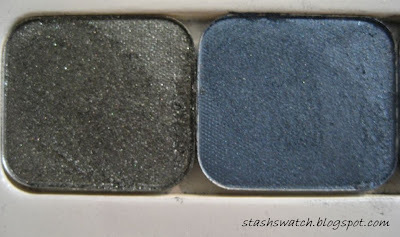 The first two shades pretty much dissapear on my lids since I'm around NC35 or so right now. 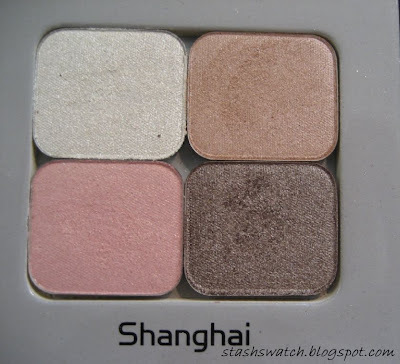 The cool neutral palette is my favorite of the 3 it contains a lightly shimmery beige, a fawn color, a matte taupe, and a darker slightly taupey grey. 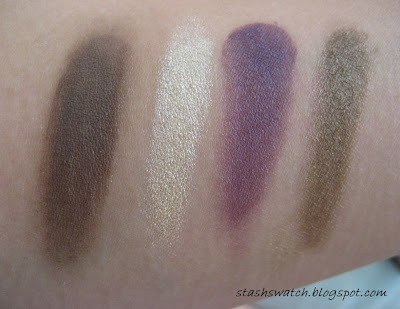 The crease shade in the giant palette pulls a lot more purple than the original though for some reason. Either way though, it's quite nice. 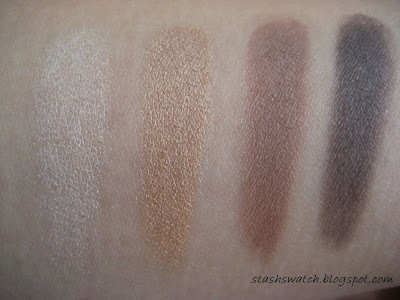 In this palette the Dark neutral palette is probably the softest texture wise out of the three. 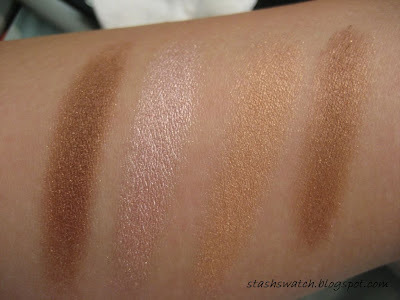 IT contains a warm, shimmery beige, a shimmery bronzy gold, a warm brown, and a matte dark brown. 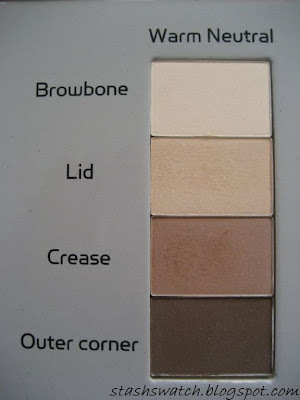 It's basically a warm neutral palette for nedium skintones. Wow, I've really been falling back on posts the last couple of months...anyways, here's a quick little update. I bought box of potions what I think was a couple months back, but as I didn't have any imaging programs installed on my netbook, neglected to post my review here of the products in this kit. 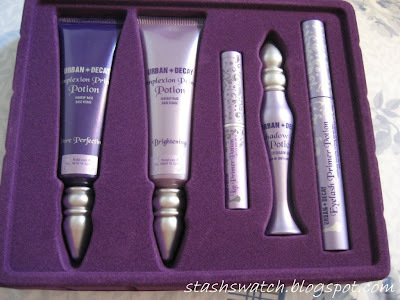 The Box of Potions retails for $65 and is available only at Sephora. Each item inside this set is full sized, making this a pretty good deal if you wanted to try out the products in this set. Unfortunately, most of the products in here were misses for me. Brightening: I should have retested this as far as lasting power goes since I wore a different foundation than I did with the Pore Perfecting primer since my powder foundation has never had super great lasting power, but I really didn't notice any brightening effects with this primer, so I left it alone. It's much less heavy feeling than the pore perfecting primer though, and also less thick. My powder foundation did go on smoothly over this, which was nice, but faded within a few hours, as usual. UDPP: I accidently opened this when I was grabbing for the lash primer in a rush and got the primer instead, but it's got the newer angled wand. This product has been a staple in my makeup routine for 3 years now, and will probably stay one for a long long time. Lash Primer: I was not impressed with this at all, but I have stick straight asian lashes that point down slightly. This wilted my curl completely and made it ridiculously hard to recurl them after the mascara was on. It did lengthen a bit, but it gave no volume for me...actually I felt like my lashes looked more sparse after for some reason, possibly because it's not real good with separation on me. I have heard of other people liking this product though, so I guess it's one of those things you have to test yourself to decide whether or not you like it. Personally, I tend not to use lash primers anyways, though I have tried a couple, and I'd say there's definitely better primes out there. All in all, I returned the set, though I did rebuy the lip primer for my MAC lustres. Price wise, it's a great set, but I personally didn't like the products in it. I'd recommend grabbing samples of the face primers in store if you wanted to test them out, but be warned that the pore perfecting primer can clog your pores. I also need to catch up on some topics I started but never finished, but we'll see how that goes. My free time's been cut into a lot recently, so I haven't really had the time to test and review products, but I'm working on it.